Rated PG-13 for mature thematic material involving human trafficking, and some violence. A sure sign that a character is a pimp? He’s the only guy in town who dons a tailored vest as casual everyday wear. How do you know a cop is corrupt? When he looks like a wizened lowlife straight out of an R. Crumb comic book. And what might be a clue that an innocent-no-more female has been sexually used and abused? Her demure white-lace dress is torn at the shoulder, of course. 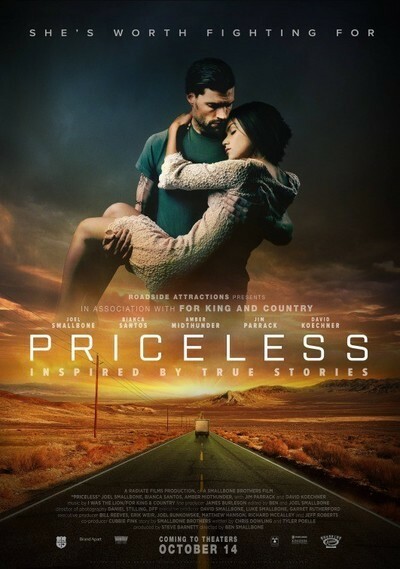 In another era, “Priceless” could have made for a nasty grindhouse-era melodrama involving the human trafficking of vulnerable young women who are forced into prostitution by unsavory male slavers. But not in the hands of Joel and Luke Smallbone, the clean-cut Aussie-born siblings behind For King & Country, a Grammy-winning Christian pop group that has escaped my notice until now. In a brief intro to a special Thursday-night showing of this supposedly inspirational yet incredibly enervating parable, Joel—the film’s leading man, who devised the story with brother Luke—actually employed the the notion of chivalry to explain their intentions. That knights-to-the-rescue notion is further expanded upon by Joel in the press notes: “Part of the DNA of For King & Country is this idea of respect and honor in relationships and women being priceless.” Meaning, in this case, not for sale. But while the intentions behind “Priceless” might be honorable, the results are much less so. It was shot in just 17 days—and looks it—primarily in and around Albuquerque, NM. What should be a lean and taut thriller based on true stories is about as exciting as watching wet socks bounce around in the dryer. Too much about it feels cheap and generic, save for moments where characters enigmatically acknowledge a belief in a higher power in hushed reverent tones. Nepotism must not be considered a sin by the Smallbone clan since another brother, Ben, who has previously done documentaries, ads, music videos and shorts, takes his bow as a feature director with “Priceless.” Meanwhile, Luke and father David act as producers. But most the weight of carrying this faith-based co-opting of a horrific real-life issue rests on the broad shoulders of Joel, a tall, dark and ornately tattooed poster boy for come-hither facial scruff. As James Stevens, a once devoted spouse and father, he has lost his way after his wife suddenly died. He turns to drinking and brawling, and ends up losing both his job and custody of his grade-school daughter. “This is my journey,” James declares literally and figuratively in a voiceover just before he and the rest of the cast start tripping over the poorly constructed script. James jumps at the chance to make some easy cash by driving a box truck cross-country, its contents unknown (his only caveat: no drugs). But he eventually discovers that he is delivering two Mexican sisters, Antonia (Bianca Santos) and Maria, to a dingy inn dubbed Motel 12 in an unnamed Southwest community, and decides he must dedicate himself to saving his human cargo. Imagine if “Taxi Driver” were devoid of any of the trademarks that turned it into a classic while Robert De Niro’s Travis Bickle was stripped of his paranoid defining traits except for wanting to protect Jodie Foster’s teen street walker. The problem is, Smallbone’s main trait as an action hero is being totally inept. Whenever he comes across a firearm, he can’t help but fumble it. At least twice, he rescues Antonia, only to have her protest that she can’t leave her underage sister behind (like, duh). He puts his makeshift sidekick, a local name Dale (funny man David Koechner, who isn’t funny here), in constant danger. And what is supposed to be a tension-filled telephone exchange with his daughter is one of the more clumsily staged scenes I have witnessed in some time. Fans of the band’s music might be disappointed that an actual song isn’t heard on the soundtrack until two-thirds of way through. And while the subject at hand is a serious one, “Priceless” could have done with some mood-lifting humor. I did laugh when Maria tells James that she wants to be a singer like Taylor Swift. She then inquires if he likes Swift. “No!” is James’ little-too-swift answer, though he admits his daughter does.